January 14th, 2016. 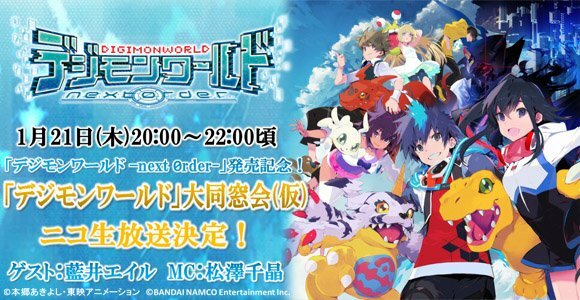 The @Digimon_games Twitter announced today that a prelaunch stream for Digimon World -next 0rder- will take place on the 21st through NicoNico Live. The doors of the "Digimon World Great Reunion" will open at 7:50 AM Japanese Standard Time on the 21st, with the stream commencing at 8:00 PM. Aoi Eir, producer of the game's title theme Accentier, will be appearing as a guest speaker representative of Digimon World's user base, having been a fan of the series since the original PlayStation game. The original production staff of Digimon World will also appear, presenting the "inside story" (裏話) of the game's production. New information about -next 0rder- will be presented at the stream. The Master of Ceremonies will be Matsuzawa Chiaki, host of the 2015 DigiFes event and the voice of Digimon Adventure tri. 's TV announcer. Other guests are the original Digimon World producer, Shindou Takayuki, its planner Minowa Atsushi, and -next 0rder- producer Fujiwara Yasunori. Is the stream going to be in Japanese or in English?